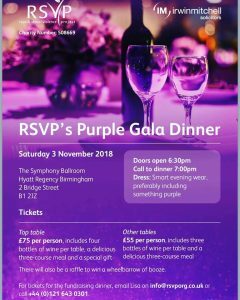 Come to one of our fabulous fundraising events, find out about our past events – or even organise an event of your own! 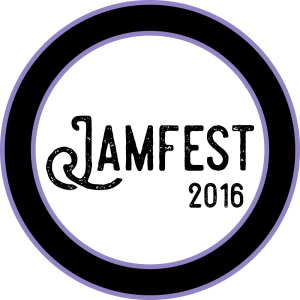 ‘A Disorder For Everyone!’ was a radical and challenging conversation about the impact of psychiatric diagnoses and survivor-centred alternative approaches to support. Friday 20th April 2018 at Carrs Lane Church Centre, Birmingham. We welcomed fantastic speakers on non- pathologising, trauma-informed alternatives responses to abuse survivors. Speakers included Lucy Johnstone, Jacqui Dillon, Clare Shaw, Akima Thomas, Jessica Eaton, Shazia Ali, Chris Coombs, Eleanor Hope, Nollaig McSweeney, Jo Watson and Lisa Thompson. 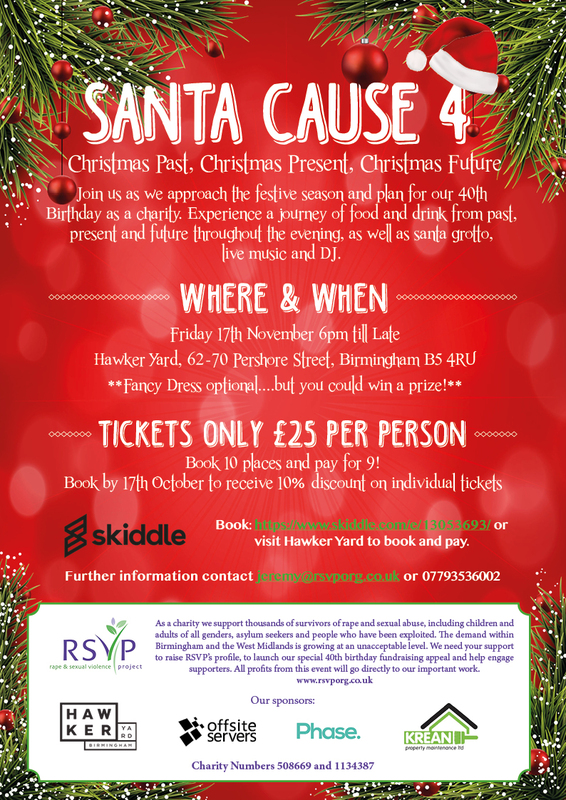 Santa Cause is our annual Christmas fundraising event, an opportunity to really shout about the important work that we do, celebrate the year’s achievements and raise some extra funds to support survivors. 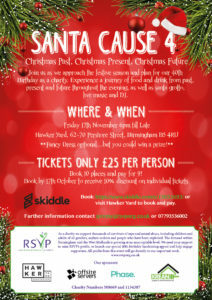 Santa Cause 3 – The Return of Mrs Cause took place on Wednesday 23rd November 2016. On 11th October 2016 we took over The Jam House in the Jewellery Quarter for a night of music and dancing featuring some of the best local artists. 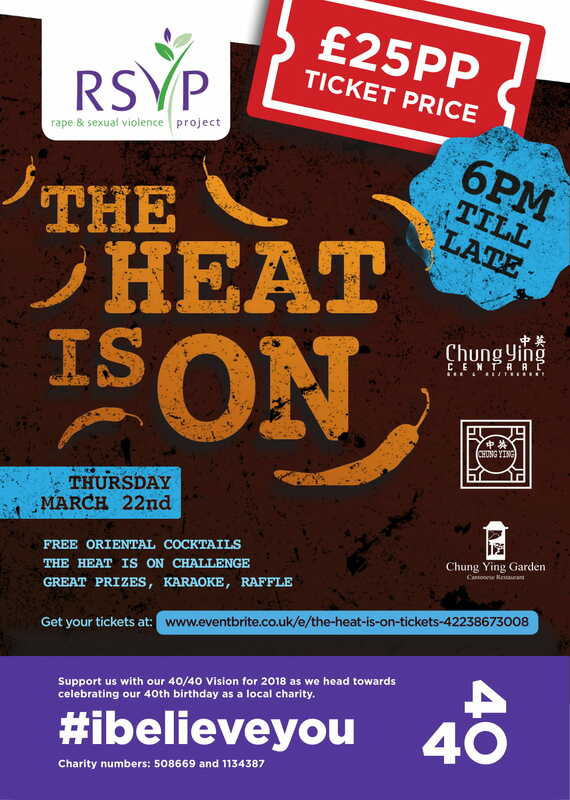 All proceeds from the event went to help survivors of sexual violence and abuse, bringing hope and confidence into their lives. 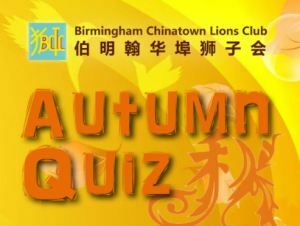 On 18th October Birmingham Chinatown Lions Club ran their annual Autumn Quiz in aid of RSVP.